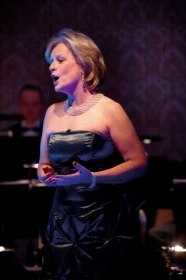 Virginia has sung with many of the world’s leading orchestras including the London Philharmonic, Royal Opera House Covent Garden, Leipzig Gewandhaus, Halle and the Royal Philharmonic Orchestra. A constant on the international stage, Virginia Kerr’s career includes celebrated performances in the world’s leading opera houses and concert halls and has taken her as far afield as Russia, Asia, Mexico and North and South America. She is a renowned exponent of 20th century music and has given numerous Irish and world premieres. Recordings include Victory’s Ultima Rerum, Stanford Requiem: The Veiled Prophet of Khorassen and her solo CD My Heart and I. In 1996 Virginia was awarded the Margaret Burke Sheridan award in recognition of her achievements in the field of classical music. A former chairperson of Opera Theatre Company, Ireland’s precursor to Irish National Opera, Virginia is a founder and joint artistic director of the Festival de Musique de Leran, a summer music festival held in the charming village of Leran in the French Pyrenees. Born in Dublin into a famous horseracing family, Virginia was reared and continues to live in Co Meath. She was educated by the Sisters of St Joseph of Cluny at the prestigious Mount Sackville School in Castleknock where she came under the guidance of the renowned Sr. Peter Cronin who was her first voice teacher. Moving to the Royal Irish Academy of Music Virginia continued her studies with the late Michael O'Higgins. Winning the Vocal Bursary at Feis Ceoil she went to London to take up a scholarship to the Guildhall School of Music and Drama in London, where her teacher was Rudolf Piernay. Her first appearance with the Dublin Grand Opera Society came as Micaëla in Bizet's Carmen, returning as Léïla in Bizet's Les Pêcheurs de Perles, Donna Elvira in Mozart's Don Giovanni and Elvira in Rossini's L'Italiana in Algeri. With the advent of Opera Ireland, Virginia Kerr appeared in the roles of Bianca in Zemlinsky's Eine Florentinische Tragödie and Zita in Puccini's Gianni Schicchi and Mrs Patrick de Rocher in Heggie's Dead Man Walking in 2007. Following the formation of Opera Theatre Company in 1986, Virginia Kerr was invited to join the Company in its initial season undertaking the role of The Governess in Britten's The Turn of the Screw. Also with OTC she appeared as Vendulka in Smetana's The Kiss and as Mrs Grose in The Turn of the Screw in 2004. Serving on the board of Opera Theatre Company since 2003, Virginia was elected the Company's chairperson the following year and occupied that position for ten years. Elsewhere in Ireland has found Virginia Kerr with Castleward Opera in the title role of Richard Strauss's Ariadne auf Naxos, with Opera Northern Ireland as Elettra in Mozart's Idomeneo and Cork Opera as Violetta in Verdi's La Traviata. Virginia was winner of the Golden Voice of Ireland competition and was honoured with the Margaret Burke Sheridan Award in 1996. Operatic appearances abroad began as The Governess in Britten's The Turn of the Screw for Birmingham Touring Opera. This was followed by the title role in Janácek's Jenufa for Scottish Opera in an acclaimed production, which received the Classical Music Award at the Brighton Festival. Among many engagements for this Glasgow based company have been the title role in Richard Strauss's Salome, Helmwige in Wagner's Die Walküre, Julie in Dvorák's The Jacobin and the Bride in the premiere production of Judith Weir's The Vanishing Bridegroom as part of Glasgow's Year of Culture programme. Virginia's Royal Opera House Covent Garden debut came in as Ortlinde in Wagner's Die Walküre, a role she sang in subsequent revivals, one of which marked Placido Domingo's London debut as Siegmund. Since then she has appeared there as Jenifer in Tippett's The Midsummer Marriage, the Woman in Schönberg's monodrama Erwartung and Guinevere in Harrison Birtwistle's Gawain. For Opera North, Virginia has taken the role of Grete in Franz Schreker's Der Ferne Klang in Brigitte Fassbaender's debut as an opera director and has appeared at the Glyndebourne Festival in Janácek's Káta Kabanová in a production that was also heard at the BBC Proms in London's Royal Albert Hall. At the Aldeburgh Festival Virginia was involved in the premiére of Nicola Le Fanu's "The Wildman" her role being written with her voice in mind. In continental European houses Virginia Kerr has made many highly successful appearances including Leipzig as Anita in Krenek's Jonny Spielt Auf and Donna Elvira in Mozart’s Don Giovanni, in Malta as The Countess in The Marriage of Figaro, in Nantes as Ortlinde in Die Walküre, in Rome as Antonia Frieth in Berkeley’s For You and in Moscow in the title role of Puccini's La Tosca to name but a few. Virginia is equally at home in the world of operetta with Rosalinda in Johann Strauss's Die Fledermaus among many roles but, probably, none has been more successful than her Hanna Glawari in Lehár's The Merry Widow of which an Irish Independent reviewer wrote "The production could hardly have a finer asset than Virginia Kerr in the title role. A stunning appearance is matched by ravishing vocal delivery and the bewitching Vilja-lied is sung with beauty of tone and elegance of phrasing." Singing with many of the world's leading orchestras, Virginia's concert and recital programmes have taken her worldwide. Of one performance a reviewer in the USA Clarion Ledger wrote, "If only every day could end with hearing Virginia Kerr sing Richard Strauss's Four Last Songs. Kerr gave a masterful performance capturing the essence of the work, her eloquent interpretation was a reminder that our brief life cycles should be embraced." Virginia Kerr has also made a significant contribution to contemporary music and is much in demand for her interpretations of new works. She gave the first Irish performance of Tippett's Yeats setting Byzantium, with the RTÉ National Symphony Orchestra conducted by Colman Pearce, in the presence of the composer. As part of the RTÉ Second Viennese School Weekend she gave memorable performances of Schönberg's Erwartung and Pierrot Lunaire. The Sunday Tribune reviewer commented on "her riveting performance" of Erwartung and that "She sailed effortlessly and fearlessly over Schönberg's huge orchestra with immaculate diction and a scarily vivid characterisation, a tour de force in every way." Virginia has continuously championed new music by Irish composers giving many premiéres including that of Gerard Victory's extended oratorio Ultima Rerum at the National Concert Hall in Dublin conducted by Colman Pearce, which was later recorded on the Marco Polo label. Appearing regularly as the featured soloist with both the RTÉ's National Symphony and Concert Orchestras, Virginia has also been a guest presenter on RTÉ lyric fm. 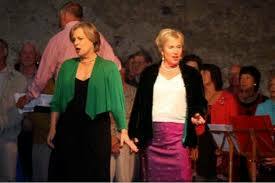 Also seen on RTÉ and BBC television she has been guest soloist on BBC Radio 2's Friday Night is Music Night programme. 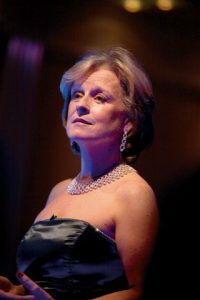 In addition to being a member of the vocal faculties of the Royal Irish Academy of Music and Maynooth University, Virginia Kerr has conducted master classes in Georgia, Mexico, China, Korea, France and the USA. She has also served as a trustee of the Christ Church Cathedral Choir Five Hundred Foundation and has been extremely active in fundraising and fieldwork for various charities. Virginia was awarded an Honours Masters' Degree in Psychotherapy and her book Stage Fright was published in 2014. 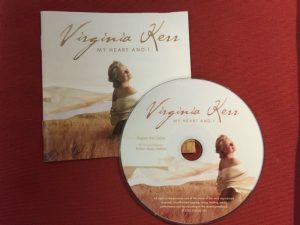 This disc title “My Heart and I”, is Virginia’s personal choice. It reflects the source of her love for the art of singing to which she has dedicated her life. The disc follows the diverse paths of her international career in its mixture of art songs, operatic arias, and songs from operettas and musicals. This disc demonstrates the versatility of Virginia as a singer. She is ever grateful to the wonderful musicians of the RTE Concert Orchestra and to her friend, mentor, and conductor Robert Dean. Virginia wishes that memories be sweet for all who listen to this disc.